Apologies for the quality of this reproduction, but the original is quite small, about an inch square, an wasn't meant for a marquee display. The idea, though, is a large one, and probably an uncomfortable one at that for the thousands of people who were considering a march to the relatively-newly-found goldfields in the Klondike region of the Canadian northwest territory. The gold was discovered in the summer of '96, and there were soon dozens of thousands of hopefuls crowded narrow pathways through prospector-choked passes over snow-covered mountains to the gold fields. Of the 100,000+ prospectors that tempted fate over the next few years, only about 4% actually struck gold. That made for 96% of the gold-seekers with the dangerous and expensive 'seeking" part accomplished but without any gold to shpw for it. Gold fever or not, revenge or not, unresponded sweat equity or not, many were no doubt tempted to find their gold in someone else's pockets. And so the insurance policy filled by Misters Smith & Wesson. And even though quite a small ad on a big page, it packed some punch. Found in the ad pages of the Scientific American, September 24, 1898. In spite of a fairly long (if not light) and ancient history, it seems as though Christian Huygens might have thought more to the shaping of extraterrestrial life than any writer to his time. [The idea of extraterrestrial life is very old, stretching far back into Hindu cosmology, and even deep into the (eighteen worlds) of the Talmud. Thales, Anaximander, Democritus, Aristole, Ptolemy all thought about and agreed on the possibilities of life being lived on places other than the Earth--infintely more life, in the case of Epicurus. Bruno, Copernicus, Fontenelle, Henry More, and Cyrano de Bergerac.] In a way, in a Asimovian way of rules, Huygens may have laid out the first real template for describing what life-not-on-Earth might look like. And in the long run, he finds that the possibilities for life Elsewhere are enormously high (and not in doubt in any way), and that it should in no way be any lesser life-formed than what we know here on Earth--and that includes "life" in all of its great complexities. Cosmotheoros' pages are filled with such reasoned arguments--remarkably so for the end of the 17th century, barely 90 years after the great publication of Galileo and 40 aftre the work of Hooke (in exploring infinities at the other end of the optic scale). The pre-Columbian voyages to the Garden of America-- by the Phoenicians, the Vikings, the Irish, the Greeks (Euphemus the Greek navigator in the 2nd century ACE) the Welsh (Madoc), the Chinese (as found in the Shan Hai King or Shanhai Jing, adapted, enlarged, engorged fictional classic some 3,000 years old), the Japanese and English--mostly have frothy, creamy icings over a rich, textured legend. One of the frothiest belongs to Saint Brendan, the Irish priest (of Clonfert or Bréanainn of Clonfert , c. 484 – c. 577, called "the Navigator", "the Voyager", or "the Bold") whose voyage to America was particularly enhanced and layered as he arrived on the back of a whale sometime in the 530’s. His legend has him exploring some of the high Texas country, though the Texans and most other won’t have him, be he one of the twelve apostles of Ireland or not. Part of the problematic part of this Irish myth of North American exploration is Jasconius, the enormous fish/whale/island that Brendan made camp upon. He and his followers (sometimes numbered in the 30’s, and other times in the 60’s), actually celebrated Easter on its back and only disturbed the creature after lighting afire on its back to prepare a meal. 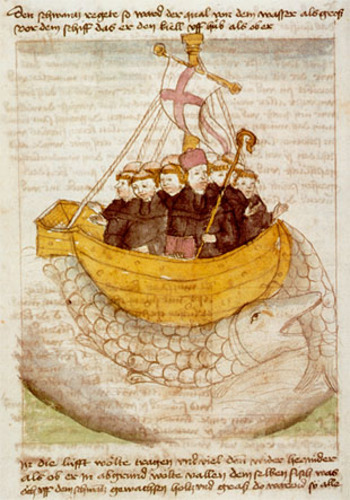 I've always loved this engraving of St. Brendan celebrating Mass on the back of the beast, his trusty ship parked on the hindquarters of the accepting creature. There are other instances of adventurers or the lost mistaking a fish for an island and landing on it—this occurs in the tales of Sinbad, the Adventures of Baron von Munchhausen and also in the fibbing world of Pinocchio. St. Branden's is the only instance however of using a fish/island in an effort to reach America.